Stitches and Scissors: Just a Peek quilt top. Just a Peek quilt top. I decide to call this one Just a Peek because you get just a peek at the ric rack on it. I loved that I thought of adding a touch of ric rack to the quilt, it makes it extra special. Stay tuned for the completed quilt soon! I have to figure out how I am going to quilt it since my husband requested that it not be as crinkly as my last quilt. Apparently he didn't like the feel of it, it made me laugh. That's fabulous! I love all the bright colors (which is surprising for me)! You did a great job and I can't wait to see the finished product! It looks great, I love the colors and the bits of ric rac! I soooo love those colours. The orange is awesome. I'd really like to do one that bright. this is just goregous. I love the colors. I was just sent a link to this beautiful quilt! 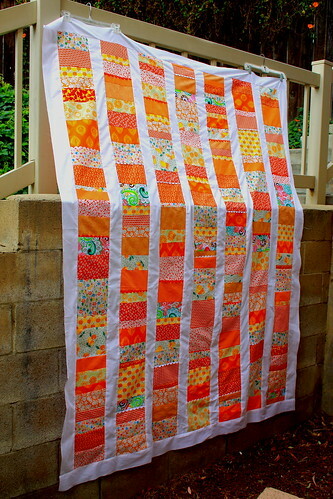 I have been collecting oranges and yellows to do an orange quilt like Tallgrass Prairie's table runner she did awhile back...but I love this one, too! I really love the vintage peach fabric and the touch of ric rack. 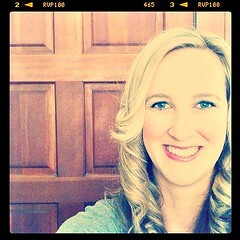 It's so nice to find other bloggers my age (by just a few days!) out there.